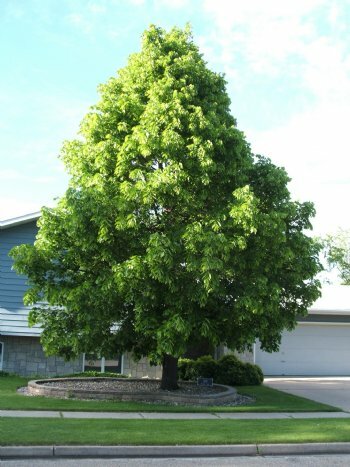 AMERICAN LINDEN or Basswood – A medium to large pyramidal tree, becoming oval to spreading when mature. May reach 50 to 75 feet in height and 30 to 45 feet in spread on suitable sites. Large, broadly ovate leaves 4 to 6 inches in length and width. Fragrant flowers in June are cream yellow in color and in clusters of 5 of 8, used as a honey plant by beekeepers. Prefers a deep, moist, well drained soil, not drought tolerant. Native from the east coast of the U.S. through the Midwest to the eastern edge of the plains. The wood is a favorite of wood carvers.